Your entire family relies on your hot water heater. They need it for showers, cooking, clothes washing, etc. When your hot water heater breaks down, it can be a big inconvenience. Let B&L Ott help by either fixing, maintaining or installing a new system for you. If you notice any of the following, you should contact B&L Ott for an inspection. Temperature Problems – If your water is too hot to too cold, there may be a problem with your thermostat. However, if there is no hot water at all, you may have an issue with a broken heating element. Rusty Water – There is a number of places you may have a problem if you discover rust while using hot water. Either the inside of your pipes or the inside of your heater may be rusting away. If not treated on time, this may cause leaks. Contact B&L Ott to get your water heater fixed both quickly and properly. Strange Noise – Rumbling, banging or whistling sounds could mean that there is sediment buildup in the bottom of your tank. This decreases efficiency as the sediment blocks the water flow and usually signifies that your heater is near the end of its life. 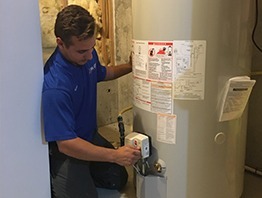 Leaks – If you find water accumulated around your water heater, there may a crack on your unit. When metal gets hot, it expands which can cause fractures on the tank. If any part of your system is leaking, B&L Ott can help. Your Water Heater is Old – Most water heaters last 10-15 years. If your water heater breaks down often or is nearing the end of its life, contact B&L Ott to learn more about your new heater options. If you are looking for a new water heater, B&L lot has a variety of different types for you to choose from. Some options include energy saving features, tankless heaters or systems that use different power sources. B&L Ott’s technicians would happy to help you select which type of heater would work best for you and your family. Don’t let a lack of hot water inconvenience your family. Contact B&L Ott to inspect or install your hot water heater. We have a professional team that will get the job done quickly and properly.